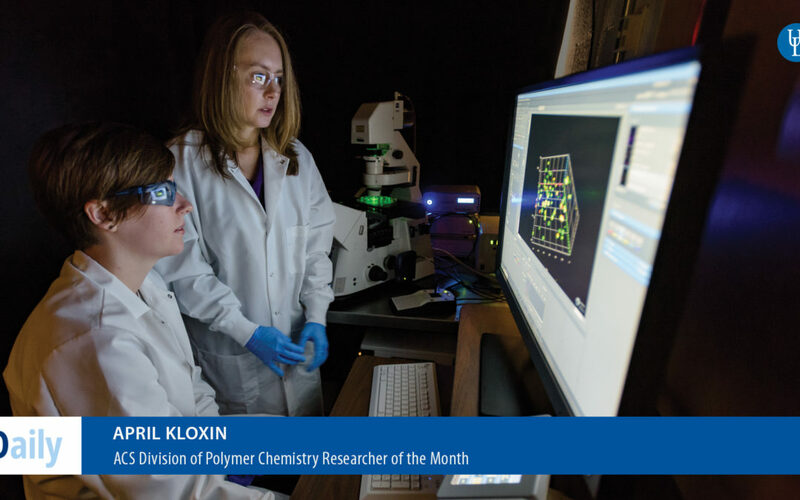 April Kloxin, assistant professor of chemical and biomolecular engineering and materials science and engineering at the University of Delaware, is the ACS Division of Polymer Chemistry Researcher of the Month for May 2018. Her research group seeks to design dynamic materials, including novel biomaterials, and use them to understand and direct important biological signals in tissue regeneration and disease. Kloxin was also recently featured on the Susan G. Komen 3-Day Blog for her work addressing the issue of late recurrence for breast cancer survivors. In 2016, she received a Career Catalyst Research Award from the Susan G. Komen Roundation for this work. Kloxin also shared why breast cancer is personal to her and her family. Her mother is a breast cancer survivor who is now 13 years disease-free, giving her insight into the challenges patients and survivors face. Kloxin and her lab group organized a team to run and walk at the Komen Philiadelphia Race for the Cure on Sunday, May 13, 2018 in honor of those who have fought or are fighting breast cancer. In addition to her roles at UD, Kloxin is a member of the Breast Cancer Research Program at the Helen F. Graham Cancer Center and Research Institute in the Christiana Care Health System.